The 2013 CIK-FIA season will be completed with the final of the KF and KF-Junior World Championships at the excellent Bahrain circuit. Run over two meetings this year, the hierarchy is already in place for the two major titles, but experience has shown that a turnaround is still possible in this race format. The verdict is eagerly awaited on Saturday night. 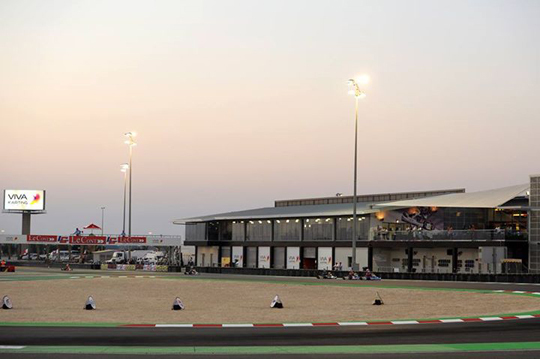 Far from the tracks known and recognized by most drivers, without testing and training, the Bahrain circuit offers new conditions in which to decide the World Champions in 2013, with a larger than usual role for raw talent. The weather is still warm in late November and the races will be at night. Also the inimitable atmosphere of such events is a new factor to manage for the drivers and an additional interest in the Championships. After the first round, we already know that 15 drivers have scored points. But we can't trust that it will stay the same, as the competition remains uncertain. Another unknown is that we don't know the final list of drivers after the first event. It is a difficult prognosis and all the elements are in place for a big event. Competitors in the KF category went on to the World stage in late August on the British track PF International, radically different to that of Bahrain. The young Dutchman Max Verstappen (CRG-TM-Vega) dominated strongly throughout the weekend and he leads the standings, with an advantage of morale over his opponents his achievements this year: two European Championship titles in KF and KZ and the KZ world title already under his belt. The Dane Nicklas Nielsen (Kosmic-Vortex-Vega) showed himself on several occasions as the most dangerous rival to Verstappen, and it will probably still be the case in Bahrain. A very experienced driver known for his combative style, Ben Hanley (ART GP-TM-Vega) has been successful in the past in difficult challenges, and the young people should be wary of the British driver still in the game. The Russian Egor Stupenkov (Energy-TM-Vega), the Canadian Lance Stroll (Zanardi-TM-Vega), the Dane Andreas Hansen (Tony Kart-Vortex-Vega), the Italian Felice Tiene (CRG-TM-Vega), the Spaniard Pedro Hiltbrand (LH-TM-Vega), the French Dorian Boccolacci (Energy-TM-Vega) or the Spaniard Alex Palou (CRG-TM-Vega) to name the top 10 from the entry, show that many individuals, nations and manufacturers are ready to fight to the end to collect the glory. For the drivers in KF-Junior, the first race of the World Championship was held in early October in Italy at Sarno, a quick and technical track not too difficult from what awaits them in Bahrain. The fight could be intense between the two young Italians who are in the top spots in the standings: Leonardi Pulcini (Tony Kart-Vortex-LeCont) the current leader and Alessio Lorandi (Tony Kart-Parilla-LeCont) his heir. Also formidable, the Russian Robert Shwartzman (Tony Kart-TM-LeCont) does not plan to make up the numbers, while the British drivers Daniel Ticktum and Enaam Ahmed, both on FA Kart-Vortex-LeCont, have the speed to compete for the title. The list of outsiders able to take a good result is consistent in a very lively class that is full of bright hopes and future champions.